First wave of RTX-powered ROG gaming laptops are here! ROG Strix SCAR II are now available, HERO II is coming soon! Plus, ASUS unveils a 17-inch Zephyrus S! ASUS Republic of Gamers (ROG) intros the improved ROG Strix Gaming laptops powered by the latest NVIDIA GeForce RTX graphics. The graphics features real-time ray-tracing technology for better gaming, superb performance and more realistic experience. With the RTX announcement, ASUS reveals its first wave of RTX-powered gaming products in the Philippines. 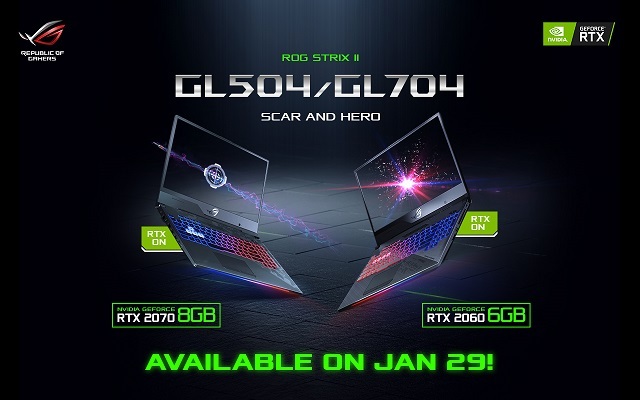 The ROG Strix SCAR, HERO GL504 and HERO GL704 are now official and will definitely tick with NVIDIA GeForce RTX 2070. The ASUS ROG Strix SCAR has a 15.6-inch and 17.3-inch variants. Both have the same 144Hz refresh rate and 3ms response time. Both variants are draped in a shooter-inspired motif which harness camouflage patterns to produce a tough and unique aesthetic. Hotkey aficionados will also love the highlighted WASD keys. Likewise, both SCAR II versions will have either NVIDIA GeForce RTX 2060 + 6GB GDDR6 VRAM, or NVIDIA GeForce RTX 2070 with 8GB GDDR6 VRAM. Both are packed with Intel Core i7-8750H, 16GB DDR4 2666 MHz RAM and 256GB NVMe PCIe SSD + 1TB SSHD storage. ROG Strix SCAR GL504 and GL704 are now available in ROG Districts, authorized retailers nationwide and ASUS ROG Strongholds in Lazada and Shopee. This gaming machine is optimized for MOBA gaming and is ideal for gamers who wanted to have a subtler machine styles. It has cyber-text patterns and contrasting features that are more restrained than the SCAR II models. Upfront, the ROG Strix Hero II is powered by the latest NVIDIA GeForce RTX2060 graphics which will definitely enable higher frame rates and will run all new next-gen games. The ROG Strix Hero II will be available soon. ASUS Republic of Gamers also revealed the world's slimmest 17-inch gaming laptop powered by NVIDIA GeForce RTX2080 Max-Q, the ROG Zephyrus S GX701. It is heavily inspired by the Zephyrus S GX531, and has the same ultra-narrow bezel 144Hz/3ms Full HD display with NVIDIA G-SYNC and Optimus technology. It also comes with a PANTHONE-validated panel so you'll definitely give your visual experience a treat. You don't have to worry about heating the extra-powerful RTX 2080 Max-Q GPU, the Zephyrus S 17-inch comes with superb cooling Active Aerodynamic System (AAS) and dual 12-volt fans and ingenious thermal management system. The ASUS ROG Zephyrus S GX701 packs 24GB DDR4 2666MHz RAM and up to 1TB NVMe PCIe SSD storage. No pricing and availability has been announced yet.